The appeal of Dubai is undeniable. Seriously, try to deny it. Whether you think it’s a city of dreams or merely a “City of Superlatives”, there’s something about this desert metropolis that entices travellers like a mirage. It’s one of the world’s most fashionable getaways for those who fancy themselves, well, fancy, but it’s also got plenty of culture. 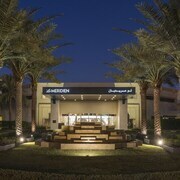 Hotels in Dubai are used to catering to the world’s elite. Now it’s your turn. Drop your bags off at your accommodation in Dubai and get ready to check off that bucket list. You could say that one of those items “towers” above all the rest: The 828m Burj Khalifa is the tallest building in the world. Unless you’re “French Spiderman” Alain Robert, who climbed the building in six hours, we recommend taking the lift to the top. Definitely check out the open-air terrace for a real rush. How’s the air up there? Dubai holidays do a lot of things right, and the markets are definitely one of those things. Souks, as they’re called, are a (sometimes actual) goldmine—particularly in the case of the Gold Souk, where you can haggle over exquisite bits of bling from rings to staggering medallions for the cover of your next self-produced rap album. Don’t let all that ice distract you though. You’re right next door to one of the last remaining traditional neighbourhoods. Step into a time machine and go back to the days when Dubai was a quaint fishing village in the Bastakia Quarter. Don’t think you have to don leather sandals and carry a khanjar dagger (though you can if you want to). These days, the buildings house modern art galleries and restaurants. 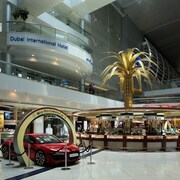 International visitors taking flights to Dubai come in by way of Dubai International Airport (DXB). You can take a taxi from arrivals, use the Dubai Metro or make your way by bus—but the easiest option is to arrange airport transfers with your hotel. Remember to leave a bit of room in your luggage on the way back, as the airports here are huge for duty-free shopping. 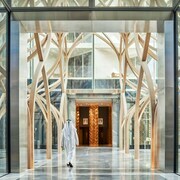 The Metro links high-traffic destinations, like the Mall of the Emirates (for even more shopping) with the Marina and Dubai hotels in the city centre. You can purchase a transit card for use on public transport. Ferries, called abras, will transport you across Dubai Creek. You can also find boats here to take you on a tour up and down the waterway. It’s pretty clear that Dubai has something for anyone—literally—and that goes for events too. Better yet, when you book Dubai accommodation during the upcoming high season of October to March, the city will be bumping. Do you like big delts and you cannot lie? Dubai Muscle Show is for you. It’s Dubai’s only international bodybuilding competition, and it’s coming at you with spray tans, baby oil and big egos galore on 21 and 22 October. Sound a little too intense? Maybe a better fit would be Dubai Design Week, which runs from 24 to 29 October. With pottery workshops, origami exhibitions and design installations throughout the city, it’s basically the exact opposite end of the spectrum. If you’re a huge fan of the Wallabies (the rugby team, not the cute marsupial), we’ve got the event for you: the Dubai Rugby Sevens in early December. Put on your wallaby suit, grab that banner and cheer on your favourite hookers with 50,000 other fans. Olé! Rugby is great and all, but Dubai’s real national sport is shopping! If you have less control around Gucci and Prada than the Real Housewives of Melbourne after a caffeine binge, you’re in the right place. And during the month of January, the fashion frenzy kicks up a notch during the Dubai Shopping Festival. Better apply for that platinum credit card. Ladies, put on your tallest heels and gents, mousse up that hair. You are in Dubai, after all, a city that loves tall things, and you’re going out! Dubai Marina is the place to see and be seen. Oh, and enjoy a cocktail or three with spectacular views over the bay. Once the sun is down—and we mean way down, like 11 pm down—follow the sequins and clouds of cologne to the city’s hottest nightclubs. There’s another bonus in this neighbourhood: It’s home to several 24-hour restaurants, so no matter when the drunchies hit you (that’s drunk munchies, for those who don’t know), the best food in Dubai is at your fingertips. At least, it will taste that way at 3 am! Spending one day in Dubai is sort of like spending a week in a lot of other cities. You’ll see so much stuff, you won’t even feel like you’re missing out! Start the day with gahwah in a Jumeirah cafe. Sound intimidating? It’s just spiced Arabic coffee. If you do want to get adventurous, try jallab instead, a syrupy molasses and rose water combo topped with pine nuts. Once you’ve got a good buzz on, see if you can remember a lesson in culture with a tour of Jumeirah Mosque, or just take some snaps of the impressive Islamic architecture. There is one thing that will get you even more likes on social media though: camels! Walk down Jumeirah Beach and you can make fast friends with these toothy beasts—or ride them, if you’re into that. But wait…what about Dubai’s impressive architecture, malls, manmade islands and indoor ski resorts? Calm down, traveller. Just hook up with the Modern City Half-Day Tour and you’ll have a sweet ride to take you to Burj Khalifa, Mall of the Emirates, Dubai Mall and Palm Islands. One and done. You don’t have to explore by camel and sleep in a desert hut when you visit the “City of Gold”. 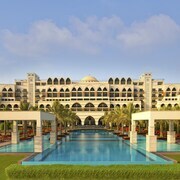 Shop around for the best places to stay in Dubai on lastminute.com.au and save cash while you’re at it. Then say “See ya!” to the same-old skyline. Your city will never look the same after this holiday.